LONDON, England (CNN) -- Almost all British troops in Iraq are being pulled out because the agreement that allows them to be there expires on Friday, the British Ministry of Defence said Tuesday. Nearly all of Britain's troops in Iraq will have left by the week's end. The withdrawal marks the first time since the invasion of Iraq more than six years ago that there will be almost no British troops in the country. The only British troops there will be a group of about a dozen helping to train Iraqi police as part of a NATO mission, the ministry said. The United Kingdom's remaining contingent of 100 to 150 troops is leaving Iraq for neighboring Kuwait, a Ministry of Defence spokesman told CNN. He declined to be named in line with policy. "The small handful of British military personnel operating in Iraq will be withdrawn to Kuwait after Iraq's parliament adjourned without passing a deal that would let them stay," the spokesman said. Iraq must give its permission for foreign troops to be on its soil. It was a group of Iraqi lawmakers loyal to anti-American Shiite cleric Muqtada al-Sadr that prevented parliament from approving a new agreement on British troops. They walked out of parliament as a group on July 11, depriving the legislature of the minimum number of lawmakers necessary for votes to take place. Parliament is now on summer recess until September 8. Fawzi Akram, a lawmaker from the Sadr bloc, confirmed that the bloc reject the Iraqi-British security agreement. He said that Iraq does not need the British troops and that Iraqi security forces are ready to handle security on their own. Britain hopes the Iraqi parliament will eventually approve the security agreement. "While this delay is unfortunate, we are continuing to seek a solution with the Iraqi Government that will provide our forces with the sound legal basis they need," the ministry said in a written statement. The British troops who are being pulled out include Royal Navy servicemen who have been helping the Iraqis to protect oil fields around the port town of Umm Qasr, according to the Ministry of Defence spokesman. All British combat troops have already left the country, another ministry spokesman told CNN. 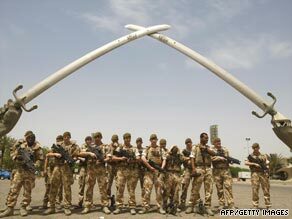 There were about 46,000 British troops in and around Iraq at the peak of major combat operations in March and April 2003, according to the Ministry of Defence. CNN's Jonathan Wald in London and Youssif Basil in Baghdad, Iraq, contributed to this report.